Will refresh, restore, and revitalize your mind, body, and spirit. If pain relief is what you are seeking, then our pain relief pedicure is for you. After running, biking, hiking, or chasing your little ones around, your feet are in desperate need of care. The nail department at Zama invites you to experience our Pain Relief Pedicure. Begin with a soothing foot bath. As you soak your feet in our soothing and detoxifying epsom salt, eucalyptus, and peppermint oil foot bath, you will feel yourself slipping into a deep state of relaxation. Following your foot soa k, you will receive expert nail and cuticle care. Rough spots are diminished and softened, leaving your feet perfectly pampered and looking their best. Let us care for your aches and pains. 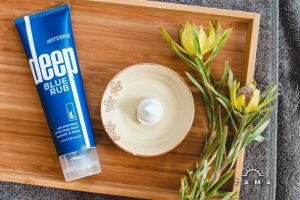 Aches and pains will disappear with a therapeutic foot and calve massage, enhanced by our proprietary cooling Deep Blue Rub. Finally, warm Eco-Fin booties heat your muscles and wipe away any remaining pain. Nails are then buffed or polished, leaving your feet softened and soothed!